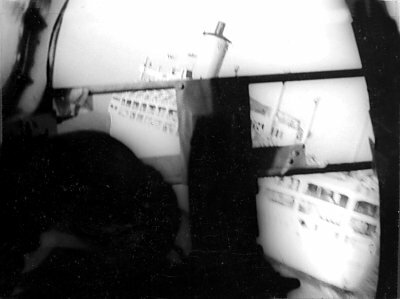 One of the more unusual projects carried out by Adastra involved supplying a camera platform to film the P&O liner "Orsova" coming in through Sydney Heads. The filming took place on 5th February 1970 with Hudson VH-AGS flown by Brian Costello and accompanied by Mike Wood and Peter Shute. (Peter supplied the amazing photographs which illustrate this account). To facilitate the filming, the navigator's seat and drift sight were removed so that the cameraman could lie on the floor of the nose compartment. The main cabin door was also removed to provide another camera angle if required. 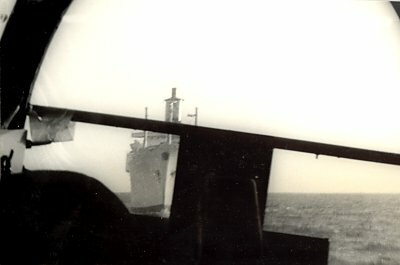 A pre-dawn take-off was planned to enable a rendezvous with the ship outside the Heads with the sun rising in the background. The flying must have been spectacular, as an eyewitness reported that the Hudson was leaving a wake on the water as it followed the ship in through the Heads! The "mission" even made the newspapers! The resultant film was used in a P&O advertisement which was shown on television about a month later. The promotion featured local show business personality Stuart Wagstaff as the presenter. Unfortunately, attempts by P&O to locate the film have been unsuccessful. Total flying time for the project was 1 hour 35 minutes. Special thanks to Peter Shute for supplying the photos and the newspaper cutting.